NAC clutches are designed for dry use. The pressure supply is fed into the cylinder via a flexible tube. Positive disengagement is achieved by the use of return springs. Sealed cylinder ensures low air consumption. Varying the supply flow rate can control speed of engagement. Single friction face design virtually eliminates drag torque. Axial thrusts are contained within the unit. The DBF series disk brake is actuated by the pneumatic pressure. The DBF series disk brake is very compact in size, and easy mounting. The DBF series disk brake has a very simple structure. 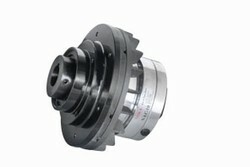 Stroke adjustment and retraction of the piston utilize the flexibility of the seal. The DBF series disk can be actuated quickly due to the small air volume and can stand high usage. 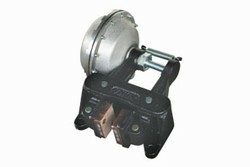 Braking force can be controlled smoothly by changing the pressure. The DBF series disc brake can be easily installed to existing machine. The DBF series disk brake is suitable for all thickness of the disc by changing the special spacer. The DBG is an economic caliper brake, which offers a wide variety of thrusters and features. Easy Pad Change: The pads can be changed in a couple of minutes. Asbestos Free Pads : The standard pads fitted are asbestos free. The DBH is an economic caliper brake, which offers a wide variety of thrusters and features. The DBM is an economic caliper which offers a wide variety of thrusters and features. Stable performance and dissipating heat of the disc brakes whichwithstand frequent uses. These brakes do not require an adjustment while they are in use, and their repairs are simple. While their braking forces may be arbitrarily adjusted, the range of braking force is widened. These brakes are resistant to dust and wetting, and withstand high ambient temperatures. Their prices are low, and their deliveries are made promptly.